The ‘one last obstacle’ turned out to be much more of a problem than I anticipated, but we got past it. 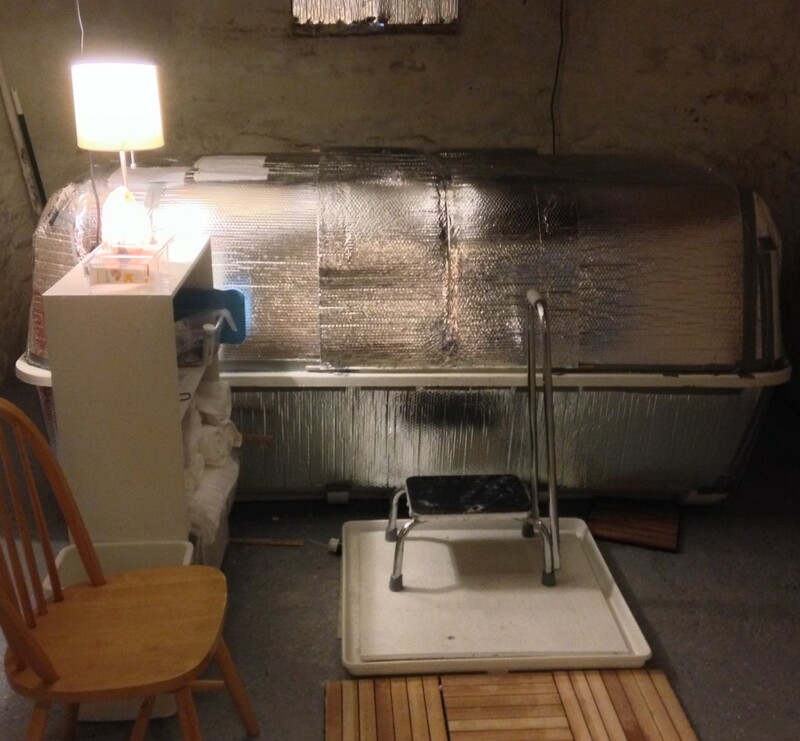 The Space Burrito: our Float To Relax tank in the basement, wrapped with several layers of insulation. We’ve got our demo tank running in the basement now, and Sara and I have both been in it! It took quite a lot longer to it fully set up than we anticipated, but along the way it’s already been totally worth it as a test bed for the public center we’re building. If you’re not on our mailing list yet, get on it! Soon we will invite a few lucky names off it to help us give it a try for free. 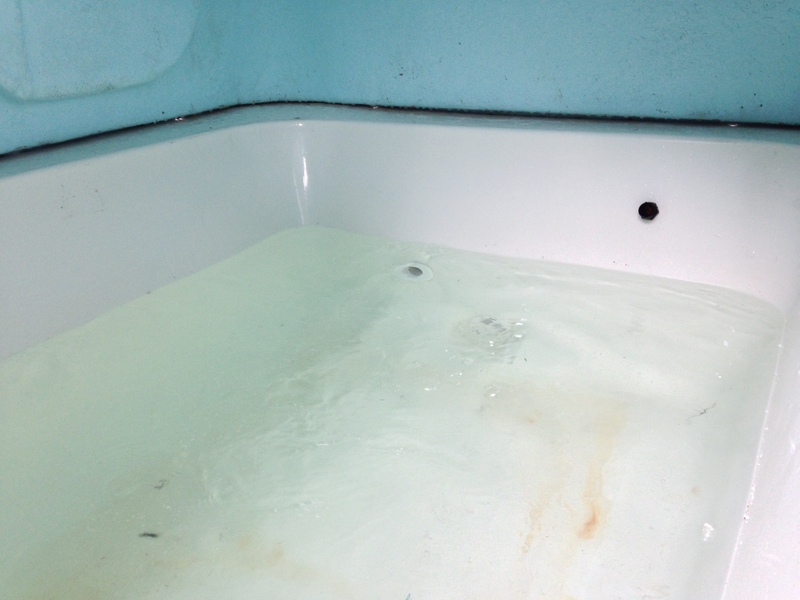 After a couple weeks of waiting, a lot has started to happen with our home float tank. 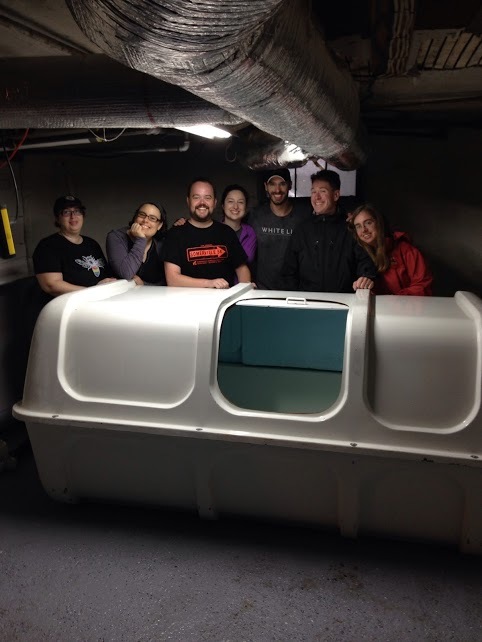 These heroes of the float revolution, the tank movers, helped shift the tank into our basement. We’ve washed and moved the tank into the basement, and I’ve put together the electrical system and welded the plumbing, and I’ve made two trips out to Lexington to load half a ton of epsom salt in the back of my Hyundai, and we’ve spent a weekend pouring it fifty pounds at a time into the tank. I had hoped to be able to announce today that my lovely wife was actually in the tank getting blissed out, but unfortunately we have run into another obstacle. Progress, though. Progress is happening. A whole lot of fix-it detail follows.